To no one's surprise at all, Mrs May has survived her ordeal by confidence motion. she has emerged with 325 votes in her pocket, as against the 306 who would have her consigned to outer darkness. This effectively removes any immediate threat of a general election and let the prime minister live to fight another day. However, whether Mrs May has staved off a crisis or merely deferred it remains to be seen. 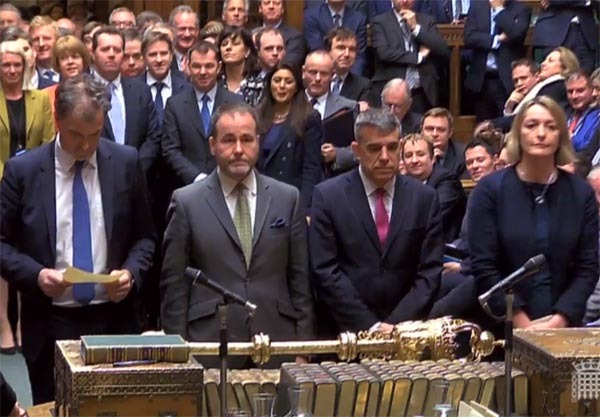 She is now required on Monday formally to present to the House an amendable motion that sets out the details of how her government plans to proceed with Brexit. And it is at this point when, we are told, backbench plotters aim to introduce a Bill which would force the Government to take the threat of a no-deal Brexit off the table within a matter of days. While this is being put in place, supposedly the plan over the next few days is to work up a series of proposals "with senior parliamentarians in other parties" to put to government as a basis for renegotiating the Withdrawal Agreement with Brussels – to which effect the government will be "forced" to ask for an extension to the Article 50 period, to give time for the negotiations to take place. These are the bare bones, as culled from a series of "exclusive" reports in the Telegraph. Such details as are available emerged from a conference call on Tuesday between Chancellor Philip Hammond and a number of business leaders. Nothing is known of the precise nature of the Bill, which – according to the newspaper - is not due to be tabled until Monday. As to whether Parliament could then force Mrs May to revoke the Article 50 notification is moot. While it has been established that its approval is needed to invoke Article 50 in the first place – on the grounds that it affects citizens' rights - no such proviso applies in reverse. Thus, the Government would be exercising Crown prerogative, over which Parliament has no direct control. Much the same would apply to seeking an extension of the Article 50 period. But, in any event, the Government could easily sabotage any forced application by making it known through back channels that it was not desirous of a positive outcome. It would only take one of the 27 EU Member States to exercise its veto and the matter would go no further. However, prominent in the reports of this stratagem is the name of Nick Boles - an MP who, in the past, has shown a lamentably tenuous understanding of EU-related law, and little capacity to learn. And, in the Daily Mail we see a report that he has "abandoned his plot" to take control of the negotiation process. This report also seems to introduce another version of his Bill. It says that if the prime minister has not secured a compromise Bill and got it through Parliament by the end of the first week of March, then she would be legally mandated to write to the EU and ask for a nine month extension to Article 50. That, we are told, "would stop no deal Brexit happening". Since this has been abandoned, though, Boles seems to have been reduced to squeaking for a nine-month extension to the Article 50 process, to allow him to pursue his ill-founded "Norway-style" deal – something that would have no chance of being implemented in its current form. That then leaves Mrs May to do her own thing, which includes her speaking to other party members, but only to discuss ideas "that are genuinely negotiable and have sufficient support in this House". Thus, we are not much further forward than we were yesterday. In fact, things could be taking a turn for the worse. Mrs May yesterday specifically invited Mr Corbyn – with the leaders of Westminster's other main opposition parties - to talks at No 10 immediately after the confidence vote. In his usual churlish style, however, the Labour leader "resisted the overture", insisting that Mrs May abandon a no-deal exit before the start of any "positive talks". His spokesman, we are told, later accused the prime minister of "blackmailing" the country with the threat of a chaotic departure. Corbyn then is yet another MP who doesn't seem to understand the meaning of the term "default". If the UK fails to ratify the Withdrawal Agreement, then on 29 March, we drop out of the treaties automatically and assume third country status. Unless Mrs May decides to revoke the Article 50 notification, or asks for a delay, that timing is fixed. While Mrs May has already made it clear that she has no intention of pursuing either option, she might find that if she does seek an extension, she will be pushing at an open door. To this I alluded yesterday, suggesting that EU Member States were largely unprepared for a no-deal Brexit and would welcome more time. More confirmation of that comes with a report from Belgium telling of the "great concern" triggered among West Flemish businesses and in the Port of Zeebrugge by the UK Parliament's rejection of the Withdrawal Agreement. Zeebrugge CEO Joachim Coens says a major share of UK bound traffic passes through the port: "As a result of the vote it's 'all hands on deck'". If there's no accord by the time the UK leaves the EU on 29 March, he adds, "we're looking at a hard Brexit with strict customs checks at Zeebrugge". Coens then observes that: "It's completely unclear what will happen. The chance of a no deal Brexit has increased. The best we can hope for is for more time to be taken. We need a transition period in which efforts are made to strike a deal". Oddly, last September, when the Independent was reporting that European shipping firms were beginning to panic about no-deal Brexit, it had a fairly relaxed Mr Coens saying: "We are preparing for a Brexit-proof port", suggesting that new digital technologies could be used to smoothen out border controls somewhat. Still relatively buoyant, he is nevertheless concerned about the possibility of congestion at Zeebrugge and regrets the increased uncertainty. "With a deal we had a soft transition of two years", he says. Despite the investment of a million euros, he fears that, "if we go to a no-deal scenario, then effectively it is chaos on 1 April". Over the next few weeks, we may see more of such reports, as continental operators begin to take in the implications of a no-deal Brexit. And with Pete on Sky Television openly accusing named "ultra" politicians of lying, we also see Jenni Russell in The Times making similar accusations, writing of David Davis and Bernard Jenkin queuing up for the TV cameras on College Green "to parade their wilful denial of the damage of no-deal Brexit". "We know about the lies and deliberate half-truths of the Brexit campaign", she says, "but even now many MPs are chillingly indifferent to basic facts" – right down to Liz Truss, chief secretary to the Treasury, claiming that "being in the single market means being in the EU". As the penny at last begins to drop and even the legacy media realises that they're being sold a crock of lies, the understanding of the consequences of a no-deal Brexit can only improve. And while the damage to the UK would be substantial, there is some mileage to be had from the fact that EU-based operations will also suffer. It is here, perhaps, that there is room for compromise. Brexit should not be the trading equivalent of mutually assured destruction and if Mrs May can capitalise on that when she next goes to Brussels – maybe there are the makings of a better deal. For Barnier to declare that it is now for the British government to clarify how the UK "wishes to proceed in organising the orderly withdrawal which it requested", is all very well. But it is as much in the interest of the EU to help us out as it is in the interests of the UK to avoid falling over the cliff. It is to no one's advantage if this becomes synchronised falling.